The ten-kilometre bicycle ride from Mariehamn, capital city of the Åland Islands, south to the small island of Järsö follows a curving road with gentle undulations. It passes over the water, skims the edges of Styrsö and Granholm, and dives into the beautiful nature and picturesque farmland of Nåtö, where small barns dot the countryside and faded wooden fences hug the curves of the road. It is a road which cuts through farmland, rock, and forest, and where the only notes punctuating the silence are car tires zipping on asphalt, leaves rustling in the breeze, and the sound of your own breath as you struggle to conquer small hills while cycling into the wind. But there is something waiting for you on Järsö to reward you for your efforts, something that will make every push of your pedals worthwhile: a slice of drottningpaj. 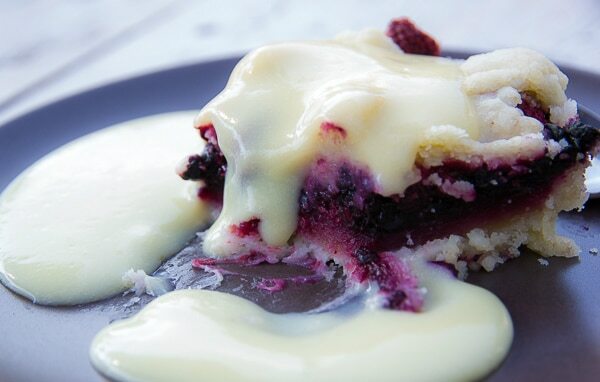 Made with plump and juicy raspberries, blueberries, and blackberries, and baked into a sweet and crunchy crumble, drottningpaj is not the only pie, cake, or pastry made at Stickstuga’n Café, but it is one guaranteed to be love at first bite. Built from wooden planks and painted a familiar rusty-red colour, Stickstuga’n Café is open from May to August and exudes countryside charm. The pink and red geraniums at the base of the steps leading up to the front porch are an inviting splash of colour, and the porch itself is a cosy place where anyone would be happy to wait out a rain shower or a stormy afternoon. And with that, a cup of tea and a slice of drottningpaj served with a lashing of fresh vanilla cream is just what you need, and it is best enjoyed with a side dish of sunshine in the garden. The cream is sweet, expertly balancing the tartness of the berries, and when poured over the drottningpaj it pools thickly at the sides. If any pie is meant to be savoured, it is this one, each and every bite. It is easy to slip into reverie, daydreaming about drottningpaj, in the garden of Stickstuga’n Café. It is the perfect reward after cycling from Mariehamn, and should be part of any summer trip to the Åland Islands. During her discovery of Åland, Tanya Braaksma was a guest of Visit Åland.